Chris Walz had just moved to Chicago. It was the fall of 1988, and he was on the Red Line going downtown to look for a job. That’s when he saw it through the railing – a sign down the street, perched on the second floor of an old building, that read “Old Town School of Folk Music.” And he knew he had to know more. 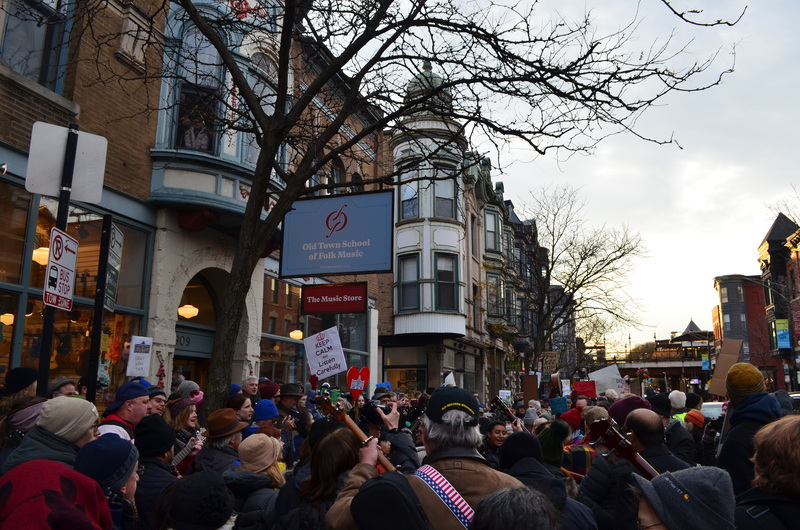 He soon found himself hanging around the Old Town School of Folk Music on Armitage Avenue in Lincoln Park, and six years later he began teaching there, attending events and meeting the community. The building is 122 years old, and has been occupied by the Old Town School since 1968, which Walz finds warmth in. That permanency is now in question, and hundreds of community members from the school are indignant about it. At the end of October, the Old Town School of Folk Music announced its plan to sell the Armitage Avenue building, also known as Aldine Hall, at 909 West Armitage Avenue. The space has been the school’s main location since 1968, just 11 years after the school’s founding. The income from the sale would help create an endowment to ensure the school’s future is secure, and they’re looking to close a sale around mid-2019. That’s when all classes and performances would move to the Lincoln Square location at 4544 North Lincoln Avenue, which the school opened in early 2012. Teachers and students aren’t happy about it, and say they weren’t properly consulted. Many feel the lack of connection between the school’s music community and the nonprofit’s administration has been stirring for some time now. Members of the community, however, feel a more urgent need to be heard. 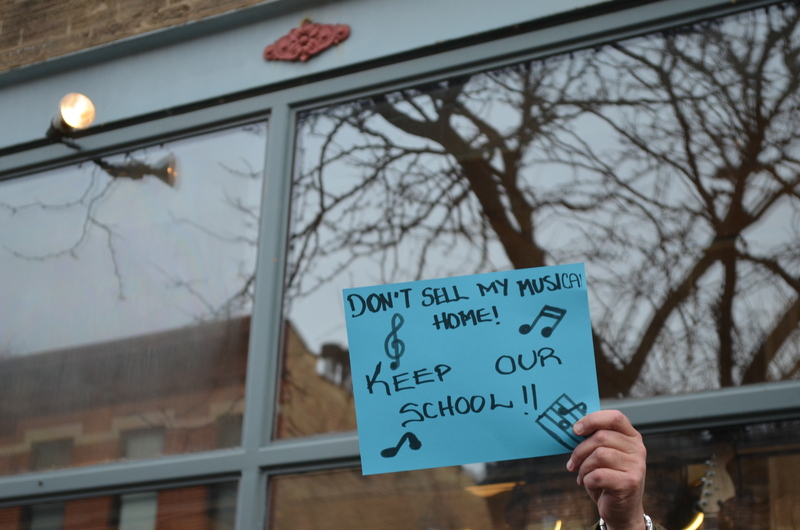 So Rich Gordon, a student at the Old Town School since 2001, started a petition to show the extent of the community’s disapproval. It has over 7,000 signatures as of Thursday night. “I did so because I – and other long-time students – have felt for several years that the school was not being well-run, that the community spirit that sustains the school was being damaged and that the student experience was being diminished,” Gordon said. There are around 400 classes at the Lincoln Square campus and around 120 classes on Armitage, according to Zibell. Most teaching artists teach at both campus locations. There are around 6,500 students enrolled between both branches, as well as suburban locations. Gordon and teachers like Walz are concerned for the rest of the staff at the Old Town School, some of whom do most of their teaching hours at the Armitage location. They fear their students might not be able to travel the extra distance to the school’s building in Lincoln Square. 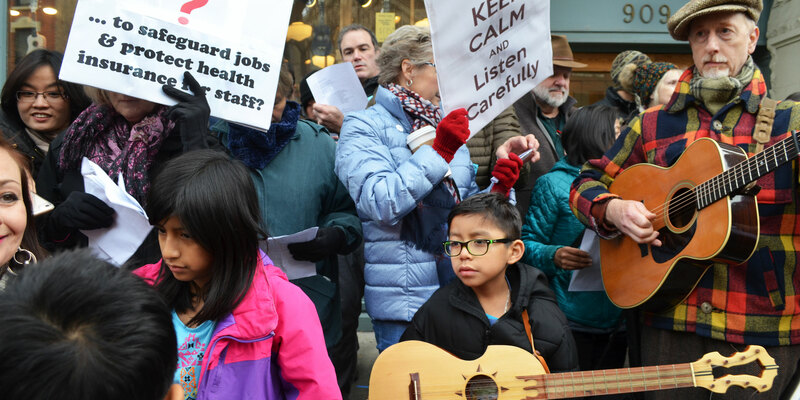 For some teachers who must maintain a certain number of hours in order to remain on the school’s insurance, the closure has the potential to interrupt their job stability. The school has more than 246 teachers, and 26 rely on the hours for insurance. Teachers and students alike feel a disconnect with the school’s administration, and wonder if they truly represent the community’s voice. Gordon and Walz both feel that the Old Town School hasn’t done enough digital marketing to work on increasing enrollment before reaching a decision to sell the Armitage Avenue building. Zibell said the school has seen around a 15 percent enrollment decline in the last five years, with closer to 30 percent at the Armitage location, although each program is different. Zibell said that moving all classes to one campus makes sense. Nearly all of the currently offered classes at the Armitage location have room to move to the Lincoln Avenue campus. “We hope as many of our students will join although we recognize location is a key component of convenience,” he said. When asked about efforts the Old Town School has made to grow enrollment, Zibell pointed to programs they offer in Chicago Public Schools, various community organizations and in suburban branch locations. Still, Gordon and others don’t want to see the roots in the Armitage location upended. 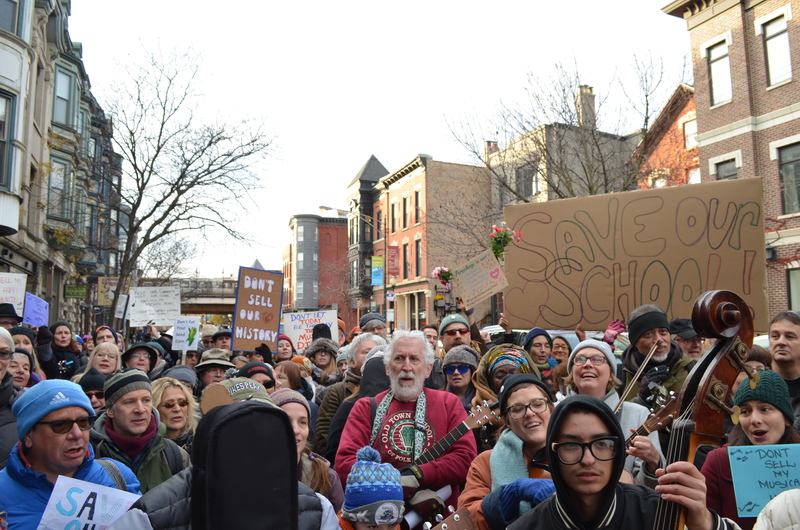 Gordon is now one of the self-described leaders of the Save the Old Town School movement, a student-led group involved in a rally outside the Armitage building on November 10. Nancy Turpin, adjunct history professor at DePaul, signed Gordon’s petition right away. “My first reactions were that the board was kidding itself if it thought the Old Town School would accept a process that excluded the community and threatened to eliminate the 909 building and put the money somewhere vague,” Turpin said. Since its beginning, the Old Town School hasn’t been just for folk music. It’s also a place for people who want to play in punk ensembles, like Rebecca Miller-Webster. Miller-Webster has been a student with the Old Town School for about a year and a half, taking classes at the Armitage building. 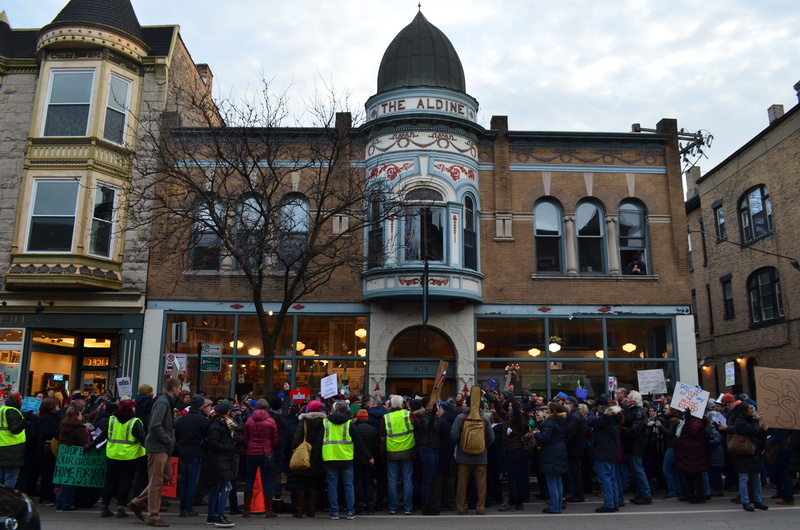 Miller-Webster and others say that the sale of the Armitage Avenue building would affect not just the folk music scene, but the larger music community in Chicago. Many teachers play in bands on the side, and the school provides an income and a bit of stability, she said.